The holiday season is over and most of us have gone back to work by now. But let’s just have a look back and think about what you did to plan your holidays. Did you use your smartphone? I think we all did ! Nowadays that mobile applications have become one of the primary (or even THE primary) means through which people communicate, shop, plan their life, or even work, travelers also rely on their mobile phones to plan their upcoming trip. 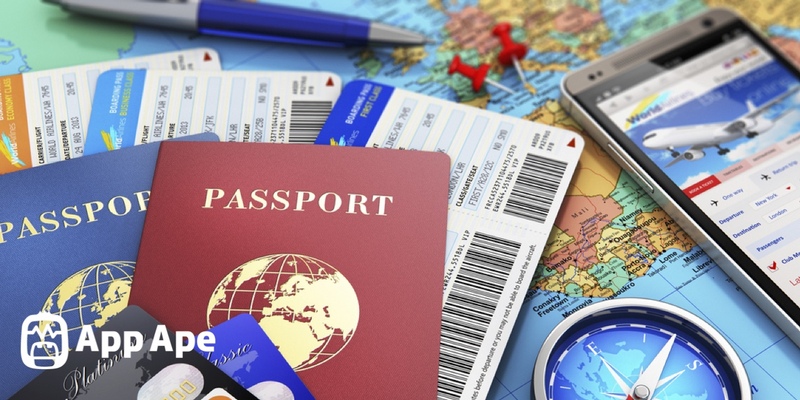 As a result, many travel apps have merged to the surface and offer smartphone users variety of services and products including booking cheap hotels and flights, renting a car, etc. 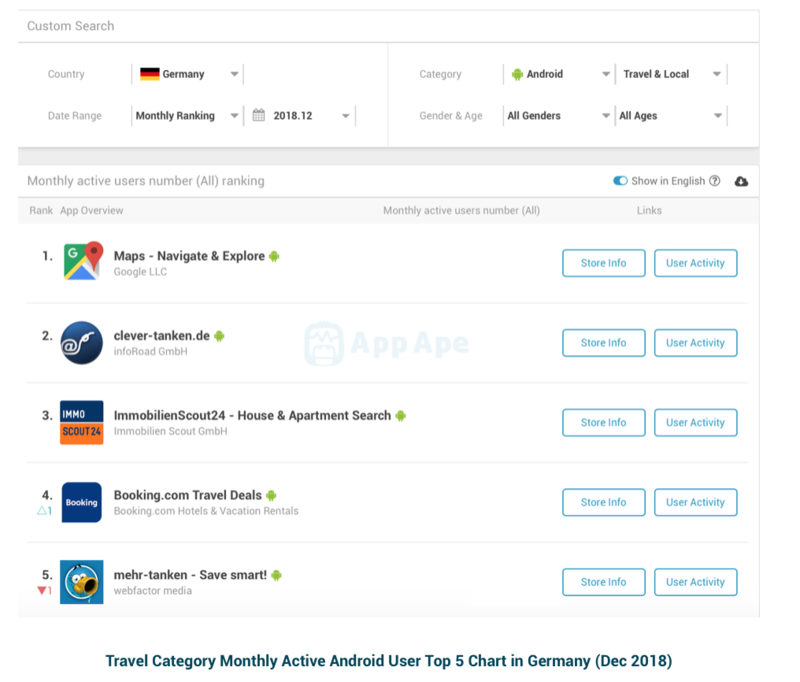 This article looks into the Travel category of Android users over the past few weeks, from 17th December 2018 to 6th January 2019. 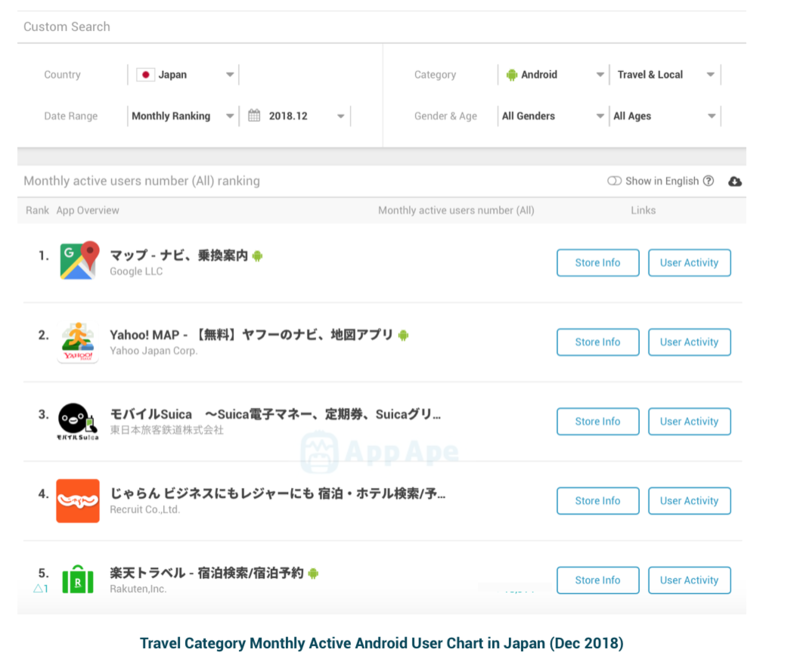 Particularly, the article tries to highlight changes and trends in travel app category’s weekly charts over the specified period in 4 different countries namely as US, Japan, India and Germany using App Ape – Japan’s No.1 Mobile Application Analysis platform. Let’s dive in ! 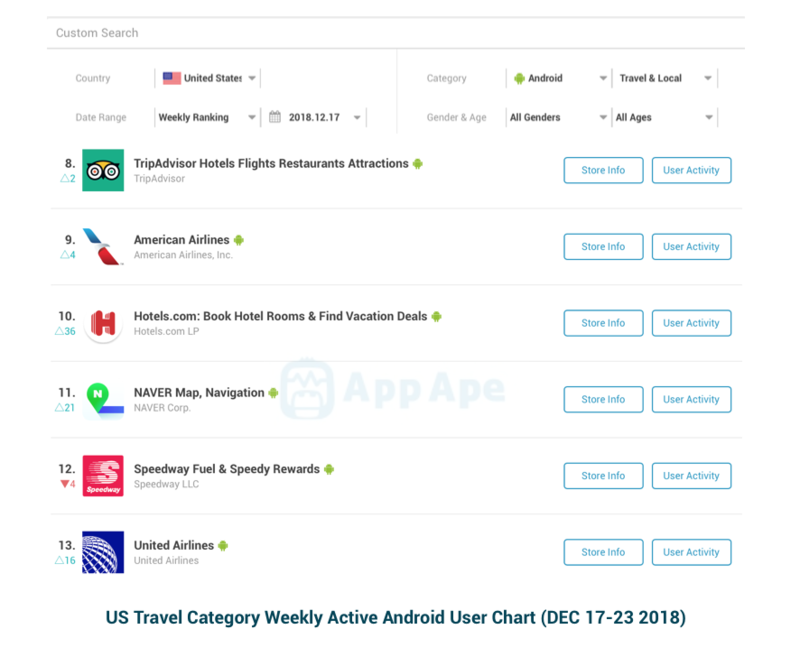 The top 5 chart of the Travel category in US for the month of December is shown above. 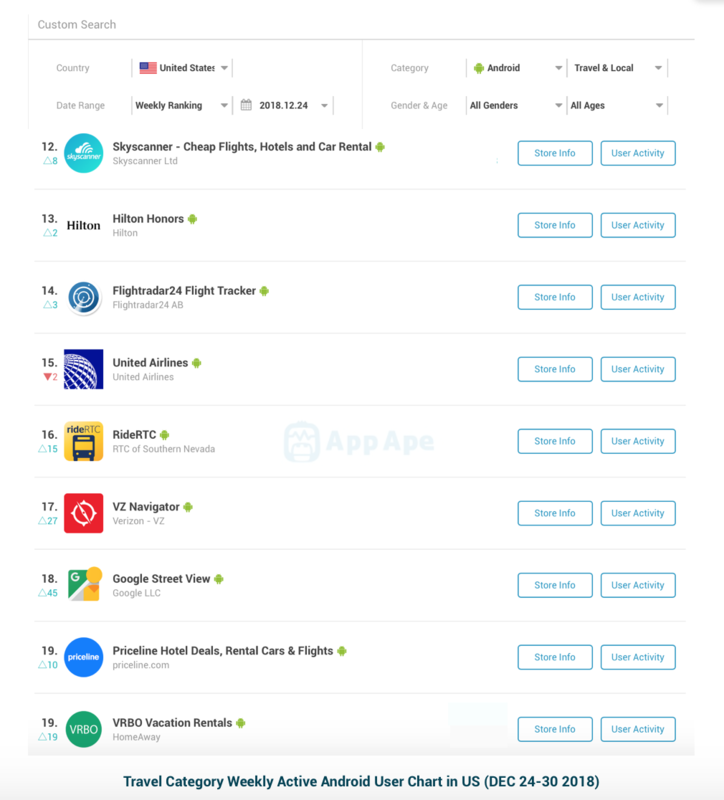 Apps providing city guide (Yelp), finding gas stations (GasBuddy), and accommodation (Airbnb) topped the chart. But let’s dig a bit deeper and have a look at changes made to the charts in weeks leading to holidays. 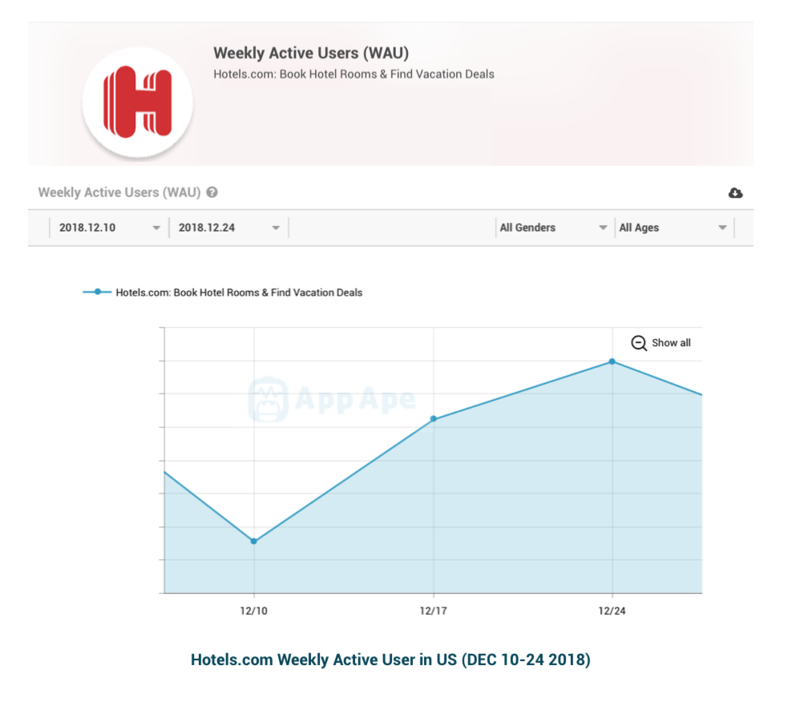 The biggest change in ranking over the week before Christmas (17th – 24th) belongs to Hotels.com, an app used to book hotels and find vacation deals, which jumped to 10th position in Top 20 weekly charts. As seen above the WAUs of Hotels.com had a steep increase before holidays began in the US, growing throughout 10th to 24th of December which is the time when travelers are planning their stay during vacations. There have been other significant changes as seen in the ranking chart. Being the holiday season, airline apps and maps (navigation apps) gain high demand. NAVER Map, a Korean navigation tool that provides public transit time, 3D view of landmarks, panoramic and aerial street view and many more features, has moved 21 ranks up the weekly charts. But what about the peak week? The week that most people are traveling around the world or their own country. That is 24th December to 3rd of January. Let’s have a look! The weekly chart (24th-30th December) is shown above. Google Street View has secured a place in top 20 charts up 45 ranks compare to the previous week. The app allows users to explore world landmarks, discover natural wonders and step inside places such as restaurants, museums, arenas, etc. Travelers wishing to get a feeling and a preview of their holiday destination or the surroundings of their place of stay is probably the most possible reason why Google Street View app has gained such popularity during holiday periods. VRBO Vacation Rentals provides a platform to find and rent houses, ski cabins, beach houses and other breathtaking places worldwide that has gained great attention during holiday season. 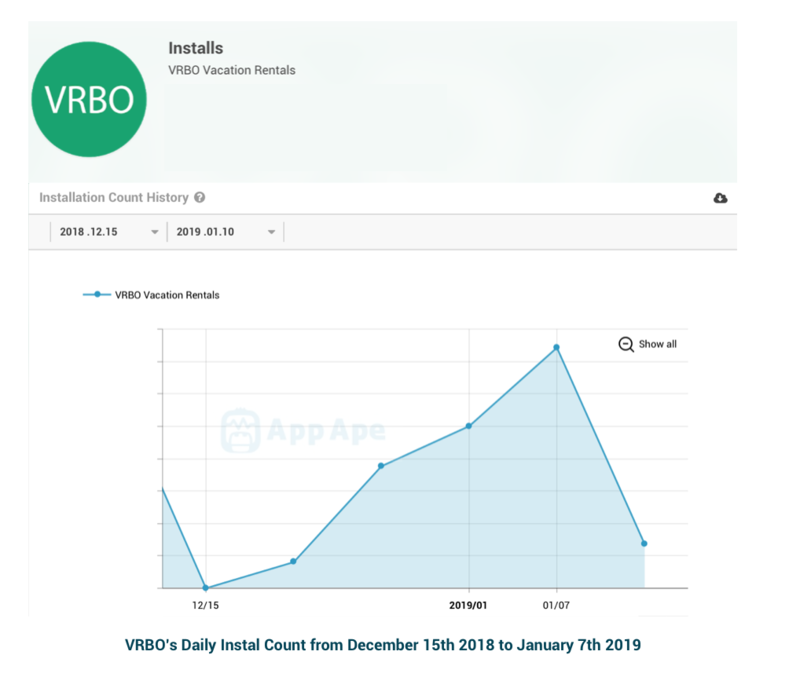 The number of daily installs, as seen below, have been on rise since 15th December till 7th January 2019. Japan : Lost in translation ! Since Christmas is not an official holiday in Japan, we will just look at the week before new year in this section. The figure below shows the top 5 MAU chart in Japan’s Travel category. Japanese use Google and Yahoo! Map apps more than any other navigation tools. Mobile Suica is a popular app in Japan for domestic travels allowing users to charge their commuter tickets and travel domestically. Jalan and Rakuten seem to be the two primary apps used to search for and book hotels inside Japan. Jalan, however, enables the user to look for domestic flights as well. But what kind of application has seen the biggest jump in weekly users over the week leading to holidays? The answer is below. 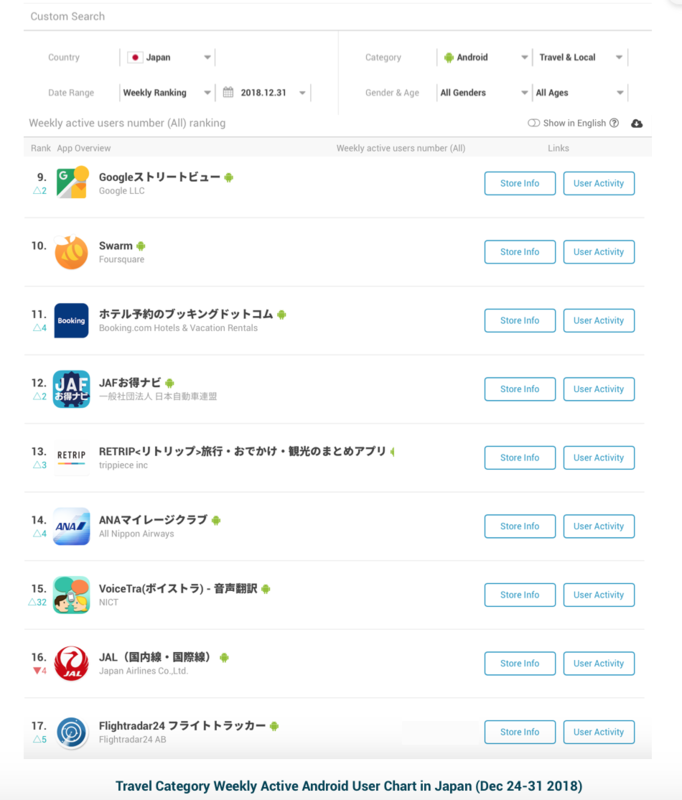 VoiceTra, a voice translator app, has climbed up the charts 32 ranks from the previous week. As the name suggests, the app is a translation tool that allows foreign people with different languages to communicate forgetting the language barrier. VoiceTra has the ability to translate 31 languages. 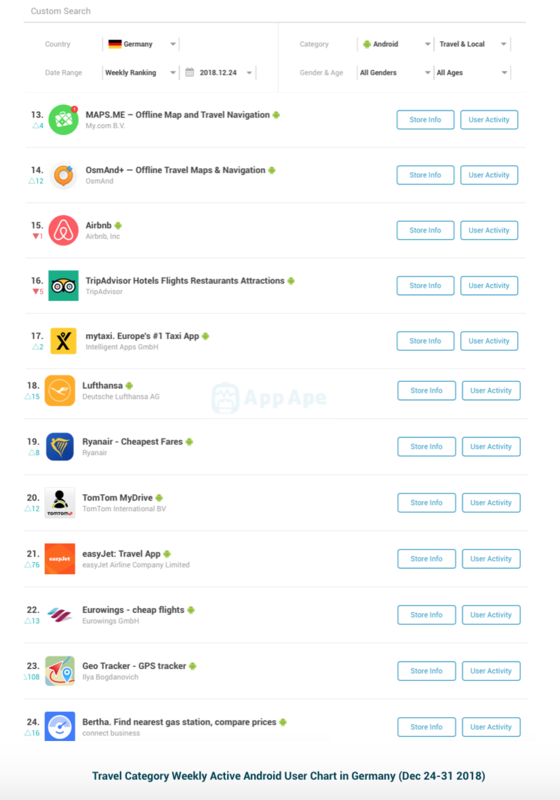 It is apparent that such app would come in handy when traveling to a foreign country which leads to no surprise as to why VoiceTra is appearing in the top 20 weekly charts. Airbnb, somewhat expectedly, does not appear in the charts as opposed to US and Germany. This could be because of the fact that Japanese people, with a unique culture, have not yet adjusted to the thought of renting someone’s house to use it as holiday accommodation or lending own’s house to strangers to be used for the same purpose. 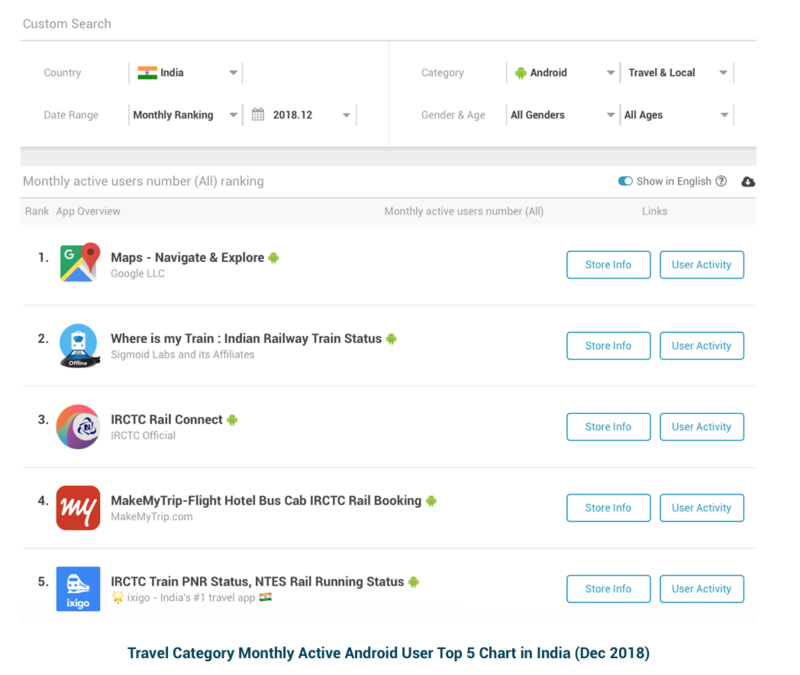 The top 5 travel apps in India in the month of December is shown below. 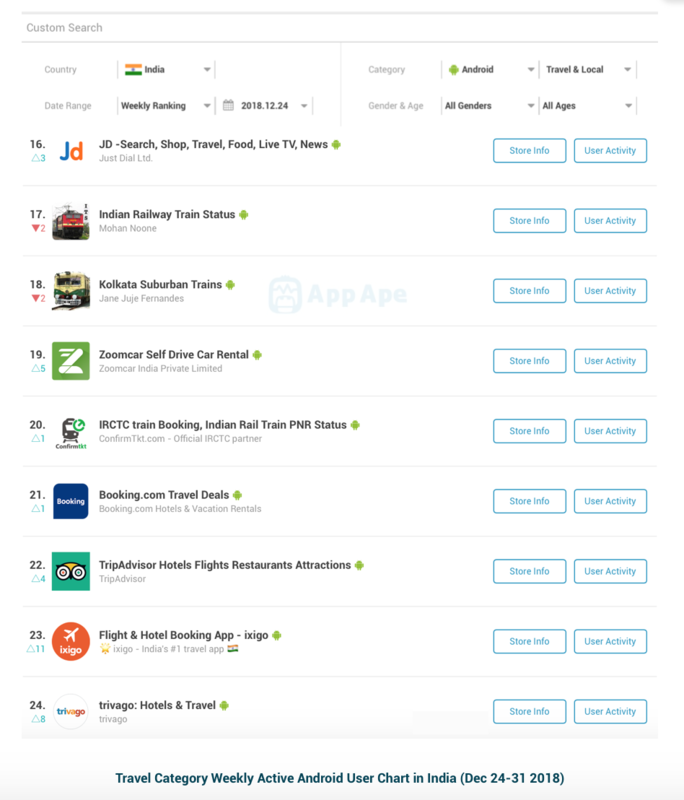 Apps that provide IRCTC services such as ticket booking and status update topped the charts in December. IRCTC is the Indian Railway Catering and Tourism Cooperation handling the railway system of India. The noticeable changes in the chart during the holiday season belong to apps such as Trip Advisor, Ixigo (a flight and hotel booking app), and Trivago (another hotel booking platform). There is a self-drive car rental app called Zoomcar that catches the eye. The app offers users in 24 cities of India to look for a rental car nearby and book it hassle-free and instantly on hourly, daily, weekly or even monthly basis. 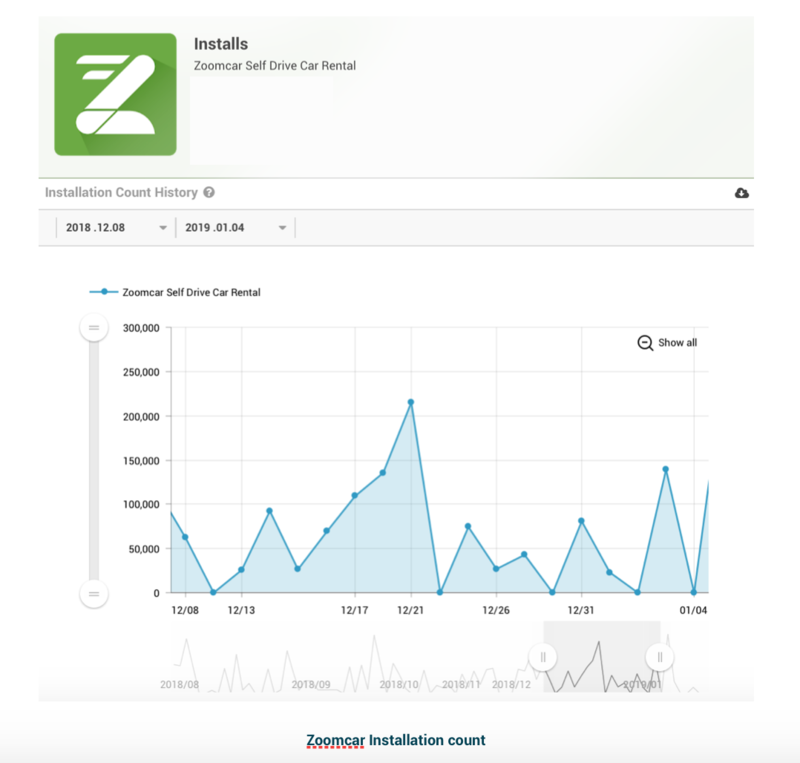 Zoomcar’s daily installs jumped dramatically just a couple of weeks before holidays as shown below. Two of the top 5 apps in December ranking chart are apps that help users find the cheapest gas stations in Germany providing the latest prices. These apps are called “clever-tanken.de” and “mehr-tanke”. As seen below, Europe’s low-cost carrier (LCC) “easyJet” has had a remarkable increase in terms of rankings in Travel category charts with 76 ranks up during the week before holidays. Ryanair, another LCC, also jumped 9 places up the chart in the same week. journey. Moreover, the app, targeted towards action sports and long travel fans, enables users to share their tracks with friends and tell them how to repeat their route and make someone else’ route that has already been stored. Offline navigation tools also seem to be popular during the holidays. 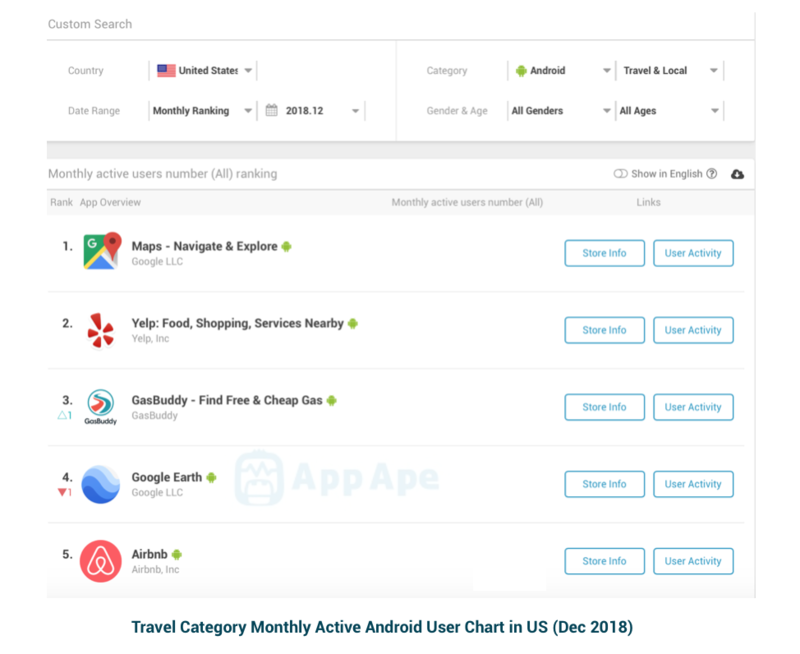 MAPS.ME and OsmAnd+ are two apps that have had quite increase in terms of weekly active users and appear in the top 20 chart of Travel category rankings. We don’t have access to Internet all the time and it would definitely be convenient to have a mobile application that would work even offline and get us to our destination. Subscription to App Ape services is free which allows access to basic data. App Ape has recently introduced a self-serve service where users can personally look at paid-subscription plans on their user profile and choose the plan that fits their needs.